Base type for a triangle mesh, parameterized by a mesh kernel. The mesh inherits all methods from the kernel class and the more general polygonal mesh PolyMeshT. Therefore it provides the same types for items, handles, iterators and so on. 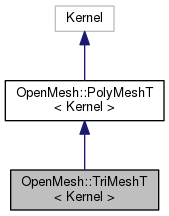 Reimplemented from OpenMesh::PolyMeshT< Kernel >. The properties of the new edges will be undefined! The properties of the new faces will be undefined!